As well as reducing quality issues such as hot tearing, boron also provides enhancements to some key properties such as electrical and heat conductivity. Inoculation is the introduction of a second phase particle into the melt in order to enhance grain refinement or modification. In grain refinement, the role of inoculants is to increase the number of nucleation sites and for them to be a catalyst during the early stages of solidification. Grain refinement provides an equiaxed grain structure, uniform mechanical properties, and better machinability. It also eliminates shrinkage, increases resistance to hot tearing and improves feeding. Cibula and subsequent researchers established the effectiveness of grain refinement through the addition of master alloys containing TiC or TiB2nucleating agents. Such master alloys release insoluble TiC and TiB2 particles in the melt. These particles are potent inoculants for aluminum melt and form very fine grains. However, some undesirable attributes have been noticed in this practice. When grain refining using Ti-B master alloys, TiB2 particles tend to settle down or agglomerate into clusters after they are added into the melt. Although the agglomeration tendency of TiC particles in TiC is much lower, it still presents a problem. In addition, it has been noticed that borides present in the Ti-B master alloy are associated with residual K2TiF6 and KBF6 salt, which comes from the manufacturing process of these master alloys. As mentioned above, chemical grain refiners based on Al-Ti-B are widely used in aluminum casthouses and foundries worldwide. They are a key part in improving casthouse productivity, allowing faster DC ingot casting speeds, resistance to hot-cracking, as well as improving surface finish and mechanical properties. The focus of the work Dr. Andreas Kleine, Dr. Macel Rosefort, Christina Matthies, Dr. Hubert Koch, and A.Pithan was to develop of new materials with improved properties of aluminum cast alloys. A boron melt treatment is used for increasing the electrical and heat conductivity. This effect is caused by the removal of elements like titanium, zirconium etc. Additionally boron should work as a grain refiner instead of TiB2. Hence a better grain structure with improved mechanical properties was expected. Stated below the outstanding results of this investigation can be seen. The grain refinement of the boron addition can be seen in Figure 1. In comparison to the TiB2 refined alloy the boron refined alloy yields a much finer grain structure. Figure 1: Examples for the grain structure of an GK-AlSi7Mg T6 a) with TiB2grain refinement; b) with boron. All specimens are separately casted test barsThe optimized microstructure results in significantly better mechanical properties. While the yield strength is nearly the same, the UTS has increased. But the greatest effect could be observed in the ductility. The doubling of the elongation in comparison to the TiB2 refined material is a great benefit for multiple applications. Table 1: Mechanical properties and grain sizes of the investigated specimens. All data are average values.The second main aspect in this investigation was to improve the conductivity. The well-known advantages of the boron melt treatment could be confirmed. 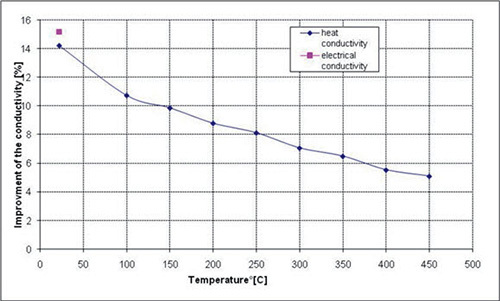 As well as the electrical conductivity, the heat conductivity could also be increased significantly, Figure 2. For example the heat conductivity is increased at RT from 178W/Km to 203W/Km. This means an overall increase of more than 14%.